Every year you face the same never-ending crisis with your Ann Arbor MI lawn. The dry, cloudless days of late summer turn your gorgeous lush green grass a brittle, dirty yellow-brown. You fight to control the damage. Garden hoses snake across the landscape feeding a cheep store bought sprinkler that have to be moved and turned on and off by hand. A better alternative would be to have a custom sprinkler system installed on your property. Lawn maintenance covers a number of different items. 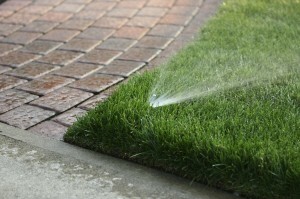 Mowing, fertilizing, weeding and watering are some of the most important. Unfortunately, they can not all be done at the same time. Wet grass needs to dry before it can be mowed. Some fertilizers and weed killers need to soak into the ground before the next watering can begin. With an in-ground sprinkler set up to a timer box in your home, you will be able to eliminate one of these factors from consideration. Watering can be set for late at night or in the pre-dawn hours giving plenty of time for the chemicals to do their magic and for the grass to dry for mowing. 1. Your landscapers make an appointment to visit your home. There they will take measurements, determine the best place to tie into your water supply, and ensure that it has the water flow capacity that you will need. 2. On the installation day, the work crew will arrive and mark out the paths that the buried water pipes will follow and where the sprinkler heads will be. 3. They will carefully cut the sod along these paths and set the removed grass aside. This will allow them to dig the shallow trenches and lay the pipes and attach the heads. 4. Afterwards they will bury the pipes and carefully replace the sod they had removed earlier. This means that the grass will still match where the work was done since that is where it came from in the first place. 5. Finally, after everything else is in place, they will hook up the water. They will very briefly shut off the main water supply to your home so that it is safe for them to connect the new system into your lines. An electronic valve will be installed at the new connection with wiring run to the timer and control box that they will install wherever is most convenient for you. 6. All that is left for you to do is set the time that you want the sprinkler to start and how long you want them to run. When the dog days of summer come around you will still have a nice green lawn that will be the envy of your Ann Arbor MI neighborhood.